Thank you to those residents who participated in the Parkes 2030 mid-term workshops this week in Bogan Gate, Alectown, Tullamore and Peak Hill. Having reached the mid-way point in the current term of council, Councillors and staff will be visiting each township to ‘check in’ and speak with the community about the projects that have been delivered thus far, and what’s currently in the planning. Next week we will host workshops in Trundle and Parkes, with Cookamidgera to be held the following week. For more information, visit www.parkes.nsw.gov.au. up a nomination form from Council or one of our libraries. This week Council staff teamed up with Central West Lachlan Landcare to host two Environmental Workshops at Kelly Reserve to celebrate National Water Week. Kindergarten students from Bogan Gate Public School, Holy Family Primary School, Parkes Christian School and Parkes Public School learned about wetlands, waterbugs, waterbirds, water sources, recycled water and water saving, and got the opportunity to get a hands-on, outdoor learning experience about all things water and the environment. Thank you to the volunteers from National Parks Association Lachlan Valley Branch and Parkes Garden Club for their assistance. A reminder that Council’s Learn to Swim program commences next week. Enrolment forms can be downloaded via our website. & Events, Destination Marketing and Visitor Information Services. This recognition highlights the successful initiatives that have been implemented to grow the visitor economy of the Parkes Region. The winners will be announced at a gala night held at the Big Top, Luna Park Sydney on Thursday, 22nd November. Congratulations to those local businesses named as finalists in the 2018 Parkes Business Awards. Hosted by the Parkes Chamber of Commerce, The Henrys are held annually to celebrate our hard working, dedicated, and innovative business community and acknowledge their achievements over the past year. The winners will be announced at a Gala Dinner held this evening at the Parkes Services Club. Residents are invited to celebrate National Bird Week at the official opening of the renewed PAC Park Amenities this Sunday, 21st October. A free community barbeque breakfast will commence from 8am. The project, funded by the NSW Department of Community Services Social Housing Improvement Fund, included the installation of a new shelter with two table settings, a double electric barbeque, a smaller shelter and new lighting. The popular Parkes Aqua Aerobics classes will commence for 2018 next week. Classes will be held every Tuesday at 7.15pm and Thursday at 6.15pm. Cost is $10 per class payable on the day. Council has been successful in receiving a $13,000 grant from the Central West Councils Environment and Waterways Alliance to facilitate site remediation around the new Water and Sewer Treatment Plants. The project is set to improve biodiversity, habitat connectivity and visual amenity at both sites. Council crews have commenced works on the Henry Parkes Way on behalf of the Roads and Maritime Service to provide a safer road environment for motorists. Works will include widening and strengthening the road in four sections starting 15 kilometres west of Parkes. There will be some temporary traffic changes to ensure the work zone is safe, so motorists should allow for extra travel time during this work. Residents are invited to celebrate National Bird Week at the official opening of the renewed PAC Park Amenities on Sunday, 21st October. Council, in partnership with Central West Lachlan Landcare Inc and the National Parks Association of NSW Lachlan Valley branch, will host a free barbeque breakfast start from 8am. The project, funded by the NSW Department of Community Services Social Housing Improvement Fund, included the installation of a new shelter with two table settings, a double electric barbeque, a smaller shelter and new lighting. We had a fantastic start to the swim season this week, with gates opening to the Parkes Aquatic Centre over the long weekend. With all Parkes Shire pool facilities offering free entry this swim season, parents and carers are reminded to keep a close watch. Children up to the age of 14 years must be accompanied and supervised by an adult. The township pool facilities will open on Saturday, 3rd November. Residents are invited to celebrate National Bird Week at the official opening of the renewed PAC Park amenities on Sunday, 21st October. Council, in partnership with Central West Lachlan Landcare Inc and the National Parks Association of NSW Lachlan Valley branch, will host a free barbeque breakfast starting from 8am. The project, funded by the NSW Department of Community Services Social Housing Improvement Fund, included the installation of a new shelter with two table settings, a double electric barbeque, a smaller shelter and new lighting. Council’s Road Safety and Injury Prevention Officer is reminding motorists that double demerits commence today, marking the start of a four-day blitz. Police will be targeting speed, seatbelts, mobile phone use and motorcyclists not wearing helmets over the October long weekend, with more police on the road throughout the Parkes Shire. Parkes Aquatic Centre opens its gate this weekend, with all Parkes Shire pool facilities offering free entry this swim season following a resolution made by Parkes Shire Council. Parents and carers are reminded to keep a close watch this swim season, with our lifeguards expecting the 2018/19 swim season to be their busiest to date. There will be a sign in register at the gate this year, to enable our staff to keep track of how many people are using the facilities. A number of projects have wrapped up recently. The newest addition to the Parkes Shire Public Art Trail has been unveiled in Trundle. The Community Wall celebrates the cultural and artistic diversity within the community. The installation of tiered seating at the Parkes Little Theatre has also been completed this week. The project, funded by the NSW Government, has significantly enhanced the performance space. Council staff have also completed the kitchen replacement at the Peak Hill Leisure Centre for the community to utilise. Next week marks the start of Small Business Month, with business owners and operators in the Parkes Shire encouraged to take part in a number of free localised events and workshops where they will gain valuable and innovative tools to take their business to the next level. During this month’s Council meeting held in Tullamore, I was delighted to have been returned as Mayor for the next two years, alongside Councillor Barbara Newton who was returned to the position of Deputy Mayor. It’s an honour to be part of this team leading the community of the Parkes Shire. I look forward to what the next two years has in store for our region. encourage people to learn more about our recycled water scheme. Congratulations is also extended to the eight recipients of the latest round of Northparkes – Parkes Shire Sports Grants. Parkes Gun Club, Parkes Horse and Pony Club, Parkes Hotel Football Club, Parkes Marist Junior Rugby League Football Club, Parkes Railway Bowling Club, Parkes Senior Cricket, Parkes Tennis Club and Trundle Central School all received part of the total $28,690.53 in funding. The program aims to support grassroots sport by replacing essential sporting equipment and infrastructure. Council staff have recently installed the new ‘Take The Lead’ signage and bag dispensers throughout Parkes, as part of our Responsible Dog Ownership campaign. The bag dispensers are located at the start of the walking track at Harrison Park, Lions Park, the Off-Leash Area off Bushman Street and Kelly Reserve. 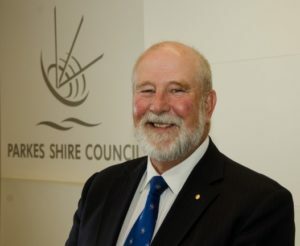 This week the Parkes Shire welcomed twelve international Consul Generals and government officials as part of a trade mission to the Central West – a fantastic opportunity to showcase the opportunities available here in Parkes, build international connections, foster relationships, and identify partnering opportunities. As part of the trip the delegates visited the Parkes National Logistics Hub, attended the launch of the 2019 Parkes Elvis Festival, and were treated to an exclusive tour inside the CSIRO Parkes Radio Telescope. The visit also coincided with an announcement by Deputy Premier and Minister for Regional NSW John Barilaro of a new Investment Attraction Package for regional NSW. The 2019 Parkes Elvis Festival program was officially launched this week. This year’s Festival theme is All Shook Up, celebrating Elvis’ iconic song and all things ‘50s. Tickets are on sale now to all events, including the 2019 Feature Concert Series, featuring US Elvis tribute artist Ted Torres Martin. We can’t wait to get All Shook Up in January! Thank you to the residents, affected business operators, agency representatives and service providers who attended the Parkes Shire Drought Forum this week. Over 90 participants, attended the community forum on Tuesday, participating in group discussions with the aim for formulating a short, medium and long-term plan. Forum facilitators, Bob and Lynda from NoaGroup Consultants will collate the outputs from the forum discussions and supply to Council to draft a report for public comment. A reminder to residents to do a spring clean ahead of the 2019 Bulky Waste Clean-up. Between Monday, 17th September and Friday, 21st September, residents currently receiving a domestic waste and recycling collection service can place waste neatly next to the edge of the kerb. The Parkes Ministers Association are inviting residents to attend the Parkes Prays for our Farming Community on Sunday, 9th September at St George’s Church lawn. We are delighted at the Federal Government’s announcement of $860,000 funding towards the widening and seal of the final 6.2 kilometre section of the Bogan Way (MR350) to address a number of bottlenecks, and complement the new two-lane Kadina Bridge near Bogan Gate delivered earlier this year. Tickets for the 2019 Parkes Elvis Festival will go on sale next week after the official program launch on Monday. For the first time ever, over 40 events will go on sale via the Festival website www.parkeselvisfestival.com.au. Today we mark the 100th anniversary of the Peak Hill silos. Built by John Howie and Sons in 1918, the original single 50,000 concrete bushel bin was the first public wheat silo in Australia. The complex has grown significantly to include a six-bin Metcalf, a weighbridge, additional storage sheds and bunkers – now owned and operated by GrainCorp. Congratulations to Parkes Jockey Club, and all involved in the restoration and rejuvenation of the historic grand stand at the Parkes racecourse. The grandstand was officially opened and named ‘Pritchard Pavilion’ at a ceremony held last Friday evening. This week Council voted to adopt a suite of drought relief initiatives, which include immediate access to domestic and stock water free of charge for rural residents from Council’s stand pipes. While this isn’t a long-term solution, we hope this will bring some short-term relief for our farming families. Last week the Parkes Integrated Water Infrastructure Renewal Program was recognised for raising the benchmark of Australian engineering standards by winning the Energy, Water and Resources Project category at the NSW 2018 Australian Excellence in Engineering Awards. It is more important than ever to invest in smart, sustainable solutions to guarantee long-term water security and through this program we have been able to deliver state-of-the-art treatment plants and strengthen our entire water network. This week Council crews have been working to repair a collapsed culvert along Collingwood Lane (SR148). The works are expected to take a number of weeks to enable the new concrete to cure. Motorists are advised that the section of road will be temporarily closed to enable the repairs to be carried out. with residents and answer any questions they may have about Council works, services, initiatives and events.